We are Long Island's Largest Inventory of Fiberglass Supplies! We Keep Our Warehouse Fully Stocked for All Your Needs. Questions about our products? Visit our FAQ page for what you need. Call our office today for more information about our company and inventory. Reinforced Plastics Lab has a wide variety of products, ranging from Vinyl Ester & Polyester Resins to Pigments & Powders to Solvents & Additives to Fiberglass Supplies and so much more. Call or visit our store today for your everyday needs. Brushes, Rollers, Paint Trays, Tyvek Suits, Rubber Gloves, Goggles, Respirators, Wedges, Drum Faucets, Squirrel Mixers, GelCoat Cup Guns, Plastic & Paper Buckets, Sanding Disks, Steel Rollers, Mixing Sticks and much, much more. Reinforced Plastics Lab is a distributor of composite raw material, serving the composites manufacturing industry for over 35 years. 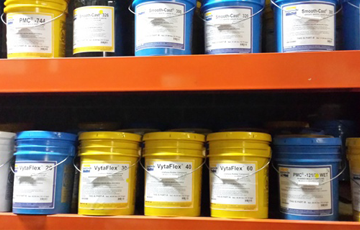 Reinforced Plastics Lab maintains a large inventory of supplies for your composite need. We are committed to providing the best quality products, excellent service and an on time delivery. We have a wide range of products ranging from fiberglass supplies, to epoxy resins, to much more! Please contact us today to learn more about all we offer.